Several illegal Israeli colonialist settlers attacked, Sunday, a Palestinian School in Burin village, southwest of the northern West Bank city of Nablus, and fired many live rounds. Ibrahim Omar, the principal of Burin Secondary School, said the school administration had to close the educational facility, and sent the children back to their homes, in fear of further violations. He added that the soldiers were present in the town during the invasion, and did not attempt to remove the assailants. The colonists also attacked a number of homes surrounding the school, while the soldiers occupied rooftops of a number of homes, and fired many rubber-coated steel bullets and gas bombs at Palestinians, protesting the invasion. 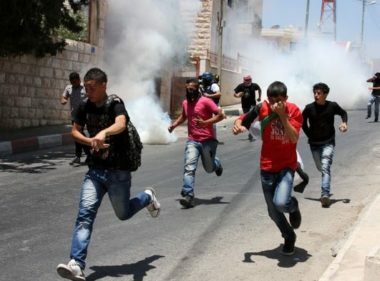 In Hebron, several schoolchildren and teachers suffered the effects of teargas inhalation, after the army attacked their school in Hebron, in the southern part of the West Bank.